Summary: Where do fruit flies come from and how do they find their way into your home? Fruit flies need a good source of food, both for the adults for their their young. If this problem has suddenly appeared, you kill them as quickly as possible as they carry bacteria and pose a few health risks. The truth is that even those that keep their homes clean can get fruit flies. As a result, wonder where are flies coming from, despite their effects to keep things tidy. Much to the dismay of shop owners and restaurants, they also have a continuous battle to fight against these creatures if they want to keep themselves and their customers free of these bacteria ridden insects. It seems that fruit flies appear overnight and it can be very difficult to get rid of them as they breed very fast. However, a little bit of education and understanding as to the makeup and behavior of fruit flies, you will be able to effectively fight this infestation properly. I will give you all this information so you are in the right place to learn! 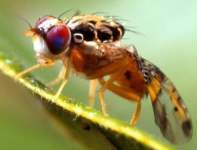 About 100 years ago, many people believed that fruit flies come from something known as “spontaneous generation” as they always keep to appear from nowhere without any apparent warning or signs of breeding. Since their tools where limited, this ideology was not limited to the common man and was even promoted by the scientists of the day. However, due to increased technology and education, we now know that fruit flies do not magically appear in your home without following the basic steps of reproduction. They have successfully been analyzed for over a century and we now have all the answers that troubled early scientists. One major aspect of their breeding process is that its extremely fast and is one of the reasons why a fruit fly problem can sneak up on you without warning. As a result, its very important to educate yourself about where do fruit flies come from and how you can put an end to their infestation without causing further risks to you and your families health. Once you have made up your mind to get rid of your fruit flies in your home or work place, the next step is to be able to easily identify them. Although its easy to know what they look like when they are sitting on your fruit in your kitchen, that wont help you when they are breeding outside. So what does a fruit fly look like? As you can see in this picture, fruit flies are rather small creatures and usually reach a maximum size of about 1/8 of an inch. If you are not too good at imagining that, just remember that about three fruit flies together will be the same size as one regular house fly. This is the quickest way to identify them and differentiate fruit flies from normal flies. Other characteristics include a brownish body (sometimes getting darker in some of the fruit fly species) and a black abdominal region. They also usually have bright red eyes that give away their true identity to those seeking to kill them. There are many types of fruit flies and according to the latest count by biology experts, there are about 175 different species in Northern America and about 3000 different variations globally. The reason why there are so many is because scientists have used the advanced methods to crossbreed species in an effort to understand their biological makeup and as a result, there are now even more species of fruit flies then there was originally in nature. How Long Do Fruit Flies Live and How Do They Breed? Once the mother has found a suitable nesting place (such as your lovely fruit bowl) and the room temperature is around 21 C, she will lay her eggs (they are similar to a flea eggs appearance but are quite a bit larger) which hatch after about 24 hours. As you can see, due to the speed at which these eggs hatch, you could literally be completely free from fruit flies in your home and then the next day, you could have a serious fruit fly problem. This rapid rate of reproduction is actually a major reason why fruit flies are rather difficult to get rid of and its best to catch the infestation as early as possible. After the previously mentioned 24 hours, the larvae will hatch and will start feasting on the surrounding food. As we can see in this picture on the left, they look like white worms and are often referred to as maggots. Please note that at this stage, they look exactly like the larvae from regular house flies. However, once they change into fruit flies, there are some key characteristics that differentiate them from normal flies and I will be writing an article on where do gnats come from to elaborate on the details in the next couple weeks. 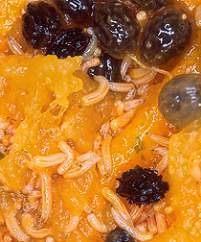 During this phase in the fruit flies development, the larvae is changing into a fruit fly inside a hardened outer shell. (otherwise known as it’s metamorphosis) Its easy to see when this is about to happen as the hardened outer shell of the larvae begins to change into a much darker color, as shown in the picture. After a short amount of time, you will have a fruit fly buzzing around your house, eating your fruit and sitting on your lovely meals. This needs to be avoided and its important to identify these signs as early as possible. And finally, we have our fruit fly and all the problems that these pests can cause in your home or office. The scary thing is that within 60 hours of coming out of its shell, the females are able to lay up to 500 eggs. And within another 48 hours, those 500 eggs will become fruit flies. Even if only half of those are female, they each can lay 500 eggs EACH after another 60 hours. And remember, that they will eat almost anything that is rotten, especially your fruit. I am sure you can see that within a very short time, you can have a huge infestation on your hands. It is especially important to be extra clean around the house (or office) if you are going to be away for a couple days as you could come back to thousands of fruit flies flying around and I am sure that you don’t want that. Finally I know where these little pests are coming from. I always thought that they came from outside, had no idea that they could be breeding right inside my house, yikes! Hi, just wanted to say thx for the gr8 info, my dad and I are going to use it on the weekend. Awesome Jamie, keep us updated! Get a container, something like a clean empty yogurt container, fill half full with apple cider vinegar,add a drop or two of dish washing detergent (not dishwasher),cover with plastic wrap, put rubber band around container, pull the wrap tight and poke holes in the wrap. I use a spaghetti noodle. Now you have a fruit fly trap. You’d be surprised how many end up in that trap. Hi Marian, thanks for the great suggestion! It is so easy to get rid of these flies, I am surprised no one has mentioned it. First, take two small dixie cups, stick one in the other tightly for added strength. Then cut two or three slices of well ripe bananas and drop in the cups. A couple of small well ripe banana peels will help. Then, take a piece of saran wrap about six or eight inches square. Stretch it banjo string tight over the top of the cups and wrap it tightly around the cups ending up twisting it tightly at the bottom. This is to prevent the flies from escaping after the next step. Once you have the contents sompletely sealed inside the cups, take a round toothpick and punch a couple of dozen holes in the saran wrap. Push the toothpick all the way in to the thickest part of the pick to make the largest hole. Make quite a few of the holes just inside the rim. Flies lighting on the rim find the near holes to the rim easier than those more to the middle. Flatten the bottom well so it will sit level or take a third cup, turn it upside down, and tape the upper and lower together to make a sturdy stand. Place the trap where the infestaation is the greatest and retire to the bedroom to read your favorite book. In twenty four hours, you will be presently surprised at all the trapped bugs. They smell the bananas, find their way thru the punched holes but cannot find their way out. When full, take outside and treat them to a propane torch or other form of torture that you can dream up. I would recommend leaving a small light on near the trap. The flies seem to become inactive in the dark. Now, wasn’t that simple? And cheap. PS You can use a larger paper cup than the dixie cup. Perhaps a coffee cup the size you get at McDonalds. Size in this case, doesn’t matter. Ive got a fruit fly infestation, millions of them. Normal fly spray just makes them hyperactive. I read an article about it, and saw the cider apple vinegar, which I didnt have, so got 2 small pots, put a tea spoonful of balsamic vinegar, and a desertspoonful of rose wine, put cling film over, with small holes in. Fantastic, glad to hear that you have had success and thank you for sharing that with us! Easiest way for me was to pour a little red wine in a glass and cover it tightly with wrap then poke a bunch of small holes in the plastic with a toothpick… The flies flew in and were unable to get out. They died happily in a bunch of wine! What better way to go! Hey Mel! Its much better 😉 I think I wouldnt mind it either lol 😛 Hehe thanks for leaving a comment, have a good one! The only thing about all of this is this never ends. You an catch them in these traps but when is it over. I am going crazy with these. I have traps all over but they still keep coming. I have cleaned scrubbed, did the drains you name it I have done it. I am ready to move out! Hey Laura! Its a pleasure! One thing you do not have mentioned here, is you can get fruit flies from non-fruit related items. One major one that needs to be mentioned, is from beer, or pop cans, and bottles that are not washed out. I am not one who eats much fruit, though I tend to like my beer every once in awhile. I never used to rinse my cans out, and ended up with a huge infestation. I removed all my cans and bottles, then continuously made sure to do so afterwards. After that, they went away. Even living in a building where you live 4+ stories, they can easily fly through your window screens, and plague you. I am thoroughly confused now. I don’t eat fruit and I have no vegetables or any other food that sits out. Recently I have been getting swarmed by fruit flies and I bought the Terro fruit fly traps they work but then a few days later they are back. There are literally hundreds in each of the 3 traps I bought. I poured bleach down the disposal but I rarely use the disposal anyway. I did a deep cleaning of my apartment and found no food particles or anything that could be attracting these. HELP!! Hi Kristine! Check your neighbors, its possible that they are away (and left stuff out) or perhaps there is a rubbish heap nearby that’s attracting them to your area. Hi Bob! Doesn’t sound like a bite from a fruit fly, perhaps it was another bug? My neighbor downstairs and I are battling these little monsters at the moment. We live in a 2-apt house, and both of us are extremely vigilant about fruit and vegetables; I have completely stopped buying fresh produce, which, for a vegetarian, is not fun. 🙁 My neighbor soaks, washes, and scrubs everything she thinks might even possibly contribute to the problem (bananas, especially). But yesterday she sent me a text asking if I had any fruit flies, as she was besieged by them. Yeah, I did. I had set out vinegar traps all over the apt, thrown everything out that I could think of, poured chemicals down drains, and was wearing a medical face mask to keep these awful things out of my eyes and nose! It was my neighbor’s day off so we decided to go get some Terro traps, just to increase our chances of getting rid of these pest. We went to Walmart – sold out. Lowe’s – sold out. Home Depot – sold out. At all 3 places the workers said they had a run on these traps the past few days. So now we are thinking, “Ok it’s not just us!” But we had to go to 3 more places to get 6 traps, and, sorry to the folks ’round here, we bought the last 6 in the county I think!! It seems to be an area-wide infestation, due to rain (the hardware store guys said that). I have no idea how we can fight against them if they are outside. We don’t leave uncovered trash outside. I don’t know where they’re coming from but I currently have 3 Terro traps out, and 6 vinegar traps out – I even put 2 “fly film” sticky things on my 2 sunniest windows, just to see if that catches anything. All this for a 500 sq ft apt!! I am losing my mind, The only sunny side to this is that I am so afraid of them landing on my food, and so “squicked-out” when I glance at the traps, that my diet’s going great – BECAUSE I AM TOO GROSSED-OUT TO EAT! Hi Victoria! Wow that’s hectic, thats the first time I am hearing about such a widespread fruit fly infestation. I suggest you focus on keeping them out by getting a window net (for those that are open). Then proceed with killing those that are alive in your home. Keep me updated! After 2 days of having homemade and Terro traps out, I think the problem is finally getting under control. I went around the neighborhood yesterday just to see if there might be an outside source, but couldn’t see any. I am still at a loss to explain how it got this bad but the local vendors seem convinced that it’s due to weather. It’s disgusting/amazing how many of these pests the traps have caught. I am still seeing quite a few sitting on top of the traps, but I tell myself it’s just a matter of time before they fall in. All my windows are closed, and this morning was trash pick-up day so I threw everything and anything I might even remotely think would be contributing to this problem. Fingers crossed that this nightmare will be over soon! The Terro traps last 30 days, and I might just keep one or two around, all the time, to prevent another invasion. Hi Victoria! Thanks for the feedback, hope you come right at the end! Just wanted to mention that sucking them up with a vacuum works well. I usually do that when I notice them or during the times I’ve had to make traps. They fly fairly slowly and are easy to catch with a vacuum that has the hose. It helps a lot with the ones who aren’t entering the traps quickly. I left my vac in the kitchen and when I had a minute here and there I’d attack them! Good for clearing the ones off the walls and cupboard doors vs waiting for them to get in the trap. Hi Lindsey! Thanks for the great suggestion! Hi, I live in a new sleek modern expensive San Francisco apartment building and we have a fruit fly problem. We have even have gone without fruit or eating in our place for a weekj – but they still appear. I wish I could send and post a photo of where the possible source is coming from – as these fruitflies have taken over the garbage collection area. I think unfortunately, I am the first to find them and lost my breakfast throwing up while throwing out the garbage. I saw a small swarm of 10 or so flies but when I looked up there were a hundred, then looking closer a thousand and closer on the black thick fece laden pipes hundreds of thousands. It is amazing but disgusting all at the same time – must be because no one on our our building management ever looks up…I have a report into the health department and looking for this to be taken care of quickly. With over 200 residence I think this would make most people think twice about paying the high rental costs and not have some of the simple things – such as sanitation as a top priority. Hi Mike! Good job on reporting it, that needs to be taken care of. Hope that they assist you as soon as possible, sorry that you have to deal with this. My sister has hamsters and rats and stuff, and I don’t think she cleans up the food often, and it includes fruit… anyway, they came one time because she didn’t clean it up, but the next time it was all cleaned up and they still came, just saw one a second ago… they come and go for no reason? They’ve been here numerous times and leave. Usually lasts a week or a few days. Hi Gretchen! Probably find their food source disappears, then they disappear. Hope that helps! When it appears thay are gone…….THEY ARE NOT !!! Continue for at least a week. Hi Peter, thanks for the tips, nice and compact, i love it! Hi Terry, check out my article on getting rid of them (it is on this blog). I think I had a type of fruit fly, but they were much smaller than the ones you pictured above. After they appeared and had been around for a month, I decided I would get rid of them. I put all my fruit in the refrigerator. I noticed when I opened the door to the frig, one or two might fly in. About 4-5 days later, I happened to look at the bottom of the frig. There must have been 30-50 of the flies lying there dead. Couldn’t take the cold. I wiped them out with a sponge with soap and water. I got fruit flies from some organic oranges, as soon as I saw the problem I left half an orange I had already juiced on my counter in a container that I could put a lid on. I had the orange which was deep because it had been juiced, in the container with no lid. Every few hours 5 or 6 flies would be in there. I rapidly put the lid on ( tight since they can escape easily ) went outside and let them fly off. I mean really, do we need to kill them when they’re outside? So after doing this for a few days, no more flies. They came, went, and are gone! Easy. If you have a severe infestation I would have a bunch of containers. Once in there they stay until their transportation to outside arrives. Hi Sheryl, thanks for the tip! Really appreciate it, it will definitely help others in future!